It’s important to know how slippery your floors are and where they are the most slippery because the only way to solve a problem is to identify what the problem is. 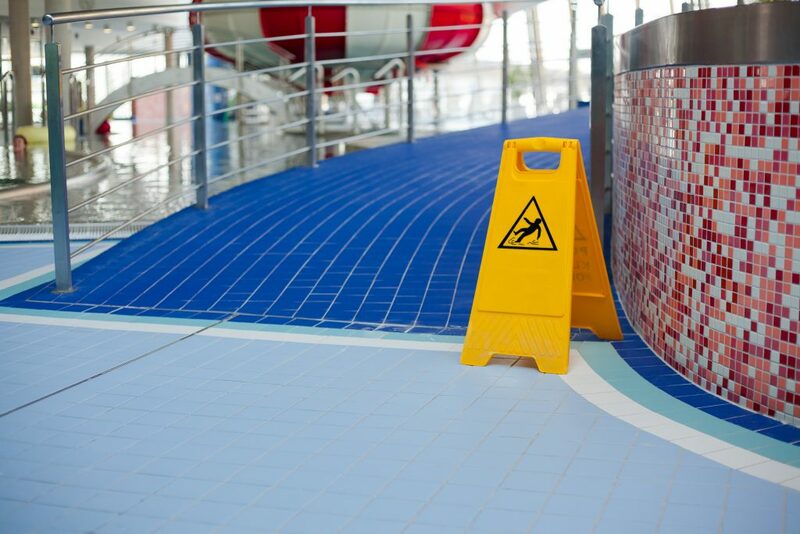 And mats can solve this slippery problem and help you and your business cut down on slips, trips, and falls. But before we talk about mats, let’s talk about floors. The most common way to assess if a floor is slippery is with a standard measurement called a coefficient of friction (COF). This is the measurement used all over the world to rate flooring for slipperiness or resistance to slipperiness. There are lots of ways to obtain this measurement, but most often, a horizontal dynamometer is used. Basically, a little machine pulls a standard weight across some flooring, like a piece of weighted rubber, and the machine measures how difficult it is or how much force is needed to pull the weight. More sophisticated testing involves putting down different materials like water or crushed ice or oil on the floor and testing it again. Interestingly enough, research has shown that just a tiny bit—like a fingerprint—of something greasy is enough to make a floor extremely slippery. The dynamometer is actually measuring friction. Friction is the resistance of material elements sliding against each other, and that’s what you want on your floors. Friction is what keeps a floor from being slippery. So, to give you an idea of the numbers we’re talking about, The Global Floor Safety Network says that if a floor’s COF is equal to or greater than .60, it provides excellent friction. Equal to or greater than .50 provides adequate friction, and equal to or less than .40 means you should do something to improve the friction. You probably already know intuitively that different types of flooring have different COF values. Concrete is not very slippery unless you add, for example, a bunch of snow and ice because concrete is rough. At the other end of the scale is something like porcelain tile, which can be very slippery. The rougher a floor is, the more friction it provides, and the more resistant it is to slip. Whatever you have for flooring, the addition of other materials like water or ice or dirt make the flooring more slippery. Which is why you need mats. Mats absorb the water and dirt, add friction, and save you a ton of money in injuries, lost workdays, bad press, and poor business image. Increase your flooring friction today with some new mats, and everyone will thank you for making your business premises safer. This entry was posted in Accident Prevention and tagged accident prevention, he Global Floor Safety Network, slippery floors. Bookmark the permalink.